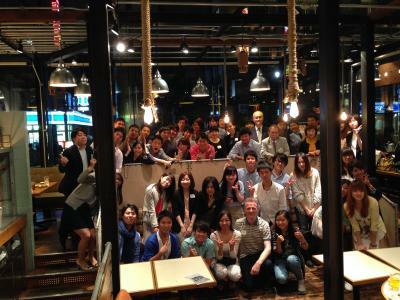 On June 7th 2014, a re-union party was held in Shinagawa celebrating the 9th year of the Euro-Japan Dialogue. Around 50 people attended the event, including members of the current cohort, previous participants, and teachers and staff who have contributed to the programme. All nine cohorts were represented, and discussions touched on special memories of the European sojourn, updates on those who could not attend, and advice for the current cohort on how to tackle presentation and debate in Europe. The re-union party in now an annual event, and since last year the cohort who are scheduled to visit Europe have attended to benefit from the advice of their seniors. This year’s cohort will visit Strasbourg, London and Norwich. They carried out semi-formal interviews of the veterans in order to build an online database for future participants. This online resource is one example of how the programme continues to expand and innovate. A range of professions was represented at the party, including bankers, venture capitalists, marketing managers, consultants and system engineers. The current cohort seized the opportunity to not only gain advice on how to conduct themselves in Europe, but also to network with a view to seeking employment. There was a healthy exchange of business cards and lively discussion on job-hunting. Next year is the 10th year of the programme and many participants expressed a wish to hold a special event on the YNU campus to commemorate this milestone. While in the current austere fiscal climate there is no guarantee that the programme will go ahead next year, it is the fervent wish of all concerned to reach that milestone and make the YNU commemoration happen.